1. Despite thinking we were good at refillables, drinks were still the main culprit. The largest category was by far those related to drinks. Coffee cups, bottles and cans. It's relatively easy to forget your travel mug, or water bottle, but over the week, those lapses of memory really did rack up the cups. And then there are the drinks that you can't get in a refillable; fizzy drinks, smoothies, and juices. Seeing the volume generated over one week reminded us that remembering a travel mug or taking one of the office ones (our local coffee shop VQ are really happy to fill up a Gate mug) makes a real difference in the volume of waste we make. For fizzy drinks, it's always worth remembering that a can or glass bottle can be recycled multiple times, whereas the plastic in a bottle gets less useful each time it's recycled, eventually ending up in landfills. See here for more on the debate about plastic, glass or aluminium. 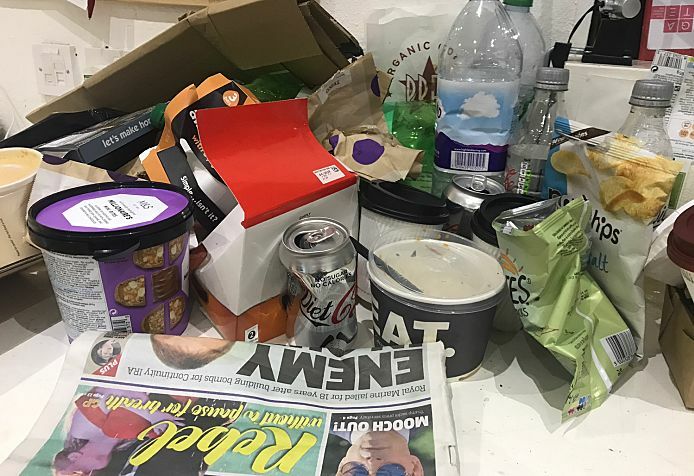 By collecting our rubbish and having it be a very visible presence in the office, rather than neatly tucked away in a bin, and waiting four days before we could sort it all and throw it out, made us consider every bit individually. The cookie packets made of a layer of paper and a layer of plastic? Well, the paper can be ripped off and recycled. The plastic spoon that came with some soup? Could have been refused, and one of the kitchen spoons used. The pile of junk mail? 15 minutes later, a couple of phone calls, and the Gate is off the mailing lists. We're a small team, with big ambitions - there's a lot to do and we have a busy, bustling, happy office. It's really easy to chuck something in the bin, in between tasks or meetings without giving it a second thought. But by taking two seconds longer, we could recycle more, make more active shopping decisions and reduce our waste. 3. People who live Zero waste, are actively thinking about what the consume. All. The. Time. Apple stickers. Used up pens. Packaging bags around bananas. Loads of the rubbish we collected was small, incidental and non recyclable. In order to cut it down, you'd need to be thinking actively about waste for every single thing you buy. The three o'clock impulse to buy a KitKat? Nope, no good. To live zero waste would take real planning and dedication. Here are a couple of zero waste heroes, if you're looking for some inspiration! Our zero waste heroes have at least one thing in common. They compost. We've got 9 members of full or part time staff in the office, and we live in 8 different locations with different councils. Of them 1 have council supported composting that we could realistically use under the restrictions of living in a flat and without a garden. So a serious question: how do you compost responsibly in a city, and even further, as a business? That's a good piece of homework for us out of this week, and we'll report back with progress, but in the meantime head to Twitter to tell us your composting methods, we'd love to learn more!